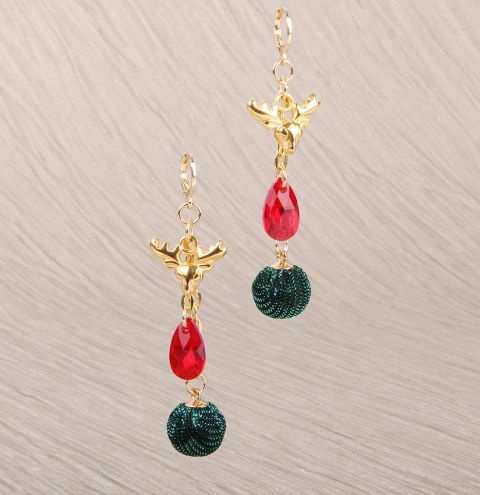 Make yourself a pair of Christmas earrings with NEW charms and Swarovski crystals. Connect two jumprings together with a pair of pliers and link them to the loop on the bottom of the earwire. Cut a length of chain 2 inches long and other 1 inch long. Open the bottom jumpring and attach both pieces of chain to it, as well as the Rudolph charm. Open two more jumprings to attach your Swarovski crystal drop pendant to the bottom of the smaller piece of chain and the fabric charm to the bottom of the long piece of chain. Repeat these steps to make your second earring.